Every funeral professional is in the education business. Families highly value learning about their options and find comfort in services that help them commemorate the lives of their loved ones with respect, beginning the process of healing and reconciliation. 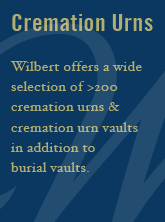 Century Wilbert is committed to ensuring that funeral professionals have the information they need in order to confidently educate families and offer regular training sessions in our presentation centre located conveniently in Toronto. If you would like more information or to book a training session, please Contact us. You can also check our list of Training and Events and register on-line.